Jesswis posted this photo on Twitter and asked if I see vendors getting cited often. I don't. It seems that there is a round-up every so often. I have seen the toy and silly string (argh!) vendors in the playground wrap their wares up lickety-split, and I have seen vendors literally pushing their carts ahead of police cars to keep distance between them. However, I always thought there was some kind of agreement that most of the time no-one would hassle the vendors. Is this a victimless crime that encourages enjoyment of our park? Or does the threat of unlicensed vendors seem reasonable considering that they are serving food, encouraging litter, and selling playthings that create a mess? I saw this woman getting cited...the third vendor I've seen cited in the park in just the last week or two. I can only assume the citation is for at least $100 -- which is an insane amount for someone just trying to earn some extra cash giving residents what they want. The bigger problem (or at least equal) is that the cop car pulled a u-turn in the middle of the park to chase after this vendor, who was already on 44th Street. The cop car came very, very close to hitting a five-year-old playing ball with his little brother -- TWICE (once at the beginning of the u-turn, once at the end). If the kid wasn't paying attention, he would have gotten nailed...since the cop clearly wasn't. AFter the u-turn, the cop literally flipped on his lights and gunned it out the park...all to catch this vendor. Ridiculous, dangerous and superfluous police work. Cop cars in that park are really going to do some damage at some point. One time I saw a woman come running breathless to a vendor (on 53rd and 4th) saying "El hombre viene!" and the sweet vendor (who was my favorite to buy from) immediately started desperately trying to throw gallons of horchata and corn on the cob and human sized mayo containers into a van behind her. I don't know the answer to your questions, but I know it sure reminded me of her humanity and what it must be like to feel helpless to make a living for your family. If people don't get the idea that police can cited vendors then anyone of us can go around the park selling our goods and turn the park into a market. Thank you to the commenters. When I first saw this photo on Jesswis' twitter, I had no idea that there would be such a full-on raid on a weekend. My personal, immediate reaction is sadness; I think that the resources can be much better used in other ways to benefit the community. I wasn't around on Sunday to see the raid myself, so I have to rely on other people's renditions. I certainly don't want to respond to 2nd-hand versions with any vehemence. I'm just disturbed that the vendors and children with them were (apparently) treated with much less evenhandedness than some of the more aggressive and dangerous people I've seen on the streets and in the park. I wonder if it has anything to do with this group's pressure on the Parks Department to issue tickets for littering. I was there on Sunday, and saw a police car make a u turn on the promenade (6th ave) and race out of the park onto 44th st., followed by a Parks Dept vehicle. It was similar to the incident Dan describes: kids were playing nearby. It seems reckless and unneccessary. The vendors were already out of the park, hiding their shopping carts between parked cars. 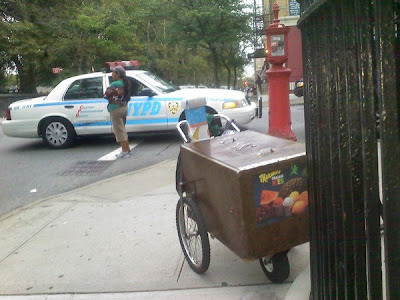 I buy shaved ice sometimes and I don't agree with the way this was handled by the police at all -- especially the dangerous driving -- but if these people don't want to deal with the police, get a different job or get a permit. The way it stands now, these people are contributing to the trash problem in the park and not paying taxes on their income to support the city in its efforts to maintain the park. Plus, it detracts from my enjoyment of the park to have my toddler asking me for toys and shaved ice all the time. As far as giving residents what they want, what if residents want to buy illegal drugs or alcohol in the park. Wouldn't we want the police to stop that, too? Where do you draw the line? As far as I know, http://cleansunsetpark.blogspot.com asked for tickets for litterers, not vendors. Police resources would be much better spent ticketing people who throw trash in the park or who live in the park and go to the bathroom in the gardens (I've seen this a lot!) than targeting families trying to get by.